There is only one way to host a hot dog eating contest. That would be with hot dogs from Nathan’s Famous. Could there be anything more American? (Well, perhaps except for Black Friday and Cyber Monday) But if the trip to Coney on July 4th is out of the way, there is a solution. 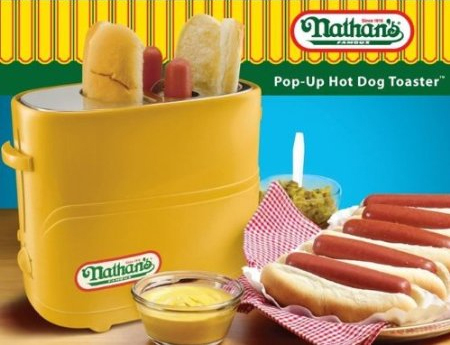 Nostalgia Electrics Nathan’s Famous Pop-Up Hot Dog Toaster looks to bring all the excitement of a hot dog eating contest into the home — just as long as you make two at a time. Which is probably for the best as we all know too much of a good thing can be, well, too much. Aaaand, speaking of holiday traditions and excess, here’s a link to the Annual Walmart Black Friday Madness.